Anyone who knows me is aware that I’m mildly obsessed with animals. Any chance I have to get an up-close and personal encounter with any animal makes my life. The ONLY reason we decided to add Chiang Mai to our trip was so that I could volunteer at an elephant sanctuary and get to see the tigers. I had spent quite a few weeks researching various animal rescue locations trying to find one that treated the animals properly and didn’t completely drain my bank account. 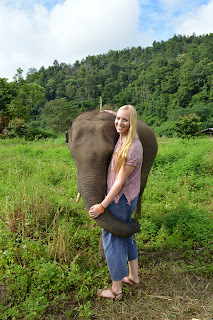 After the research, we both agreed that Ran-Tong Elephant Sanctuary would be the perfect place for us. 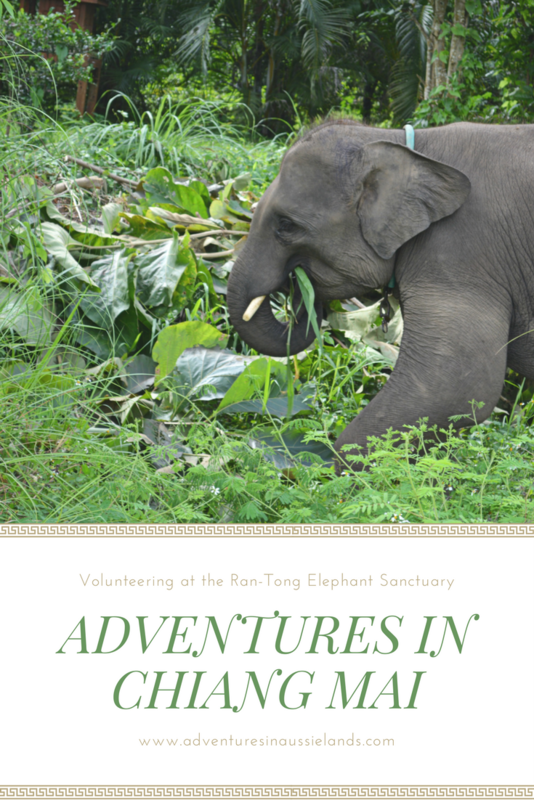 Ran-Tong Elephant Sanctuary offers a variety of packages ranging from a half day to week long volunteer projects. As we were only spending a short time in Chiang Mai, we opted for the half day package. We were picked up promptly from our hotel, Welcome More, at 7:15 am and proceeded to get the other individuals who booked the half day package. Upon arrival, you’re given clothes to change into because you will get wet and muddy. Shortly after changing, I was met with pure happiness and joy. 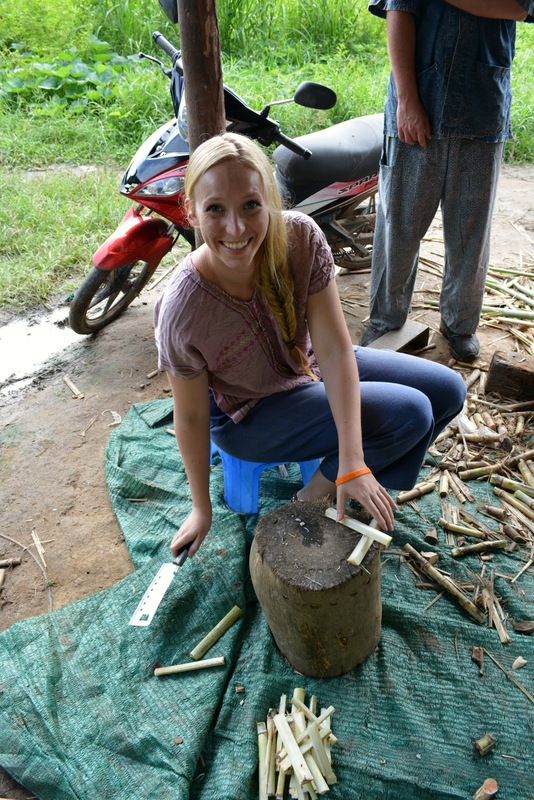 We started off by making snacks for the baby elephants. 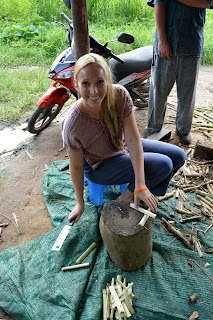 This was done by giving a massive klutz (me) a dangerously large knife to cut sugar cane into fourths. Personal tip, stash as many little sugar snacks as you can. This will give you more face to face time with the elephants. From there, we journeyed down a short path to where the mummy and baby elephants were wandering. As none of the elephants are chained or on ropes, they come to you when they feel comfortable or when they see their handlers. 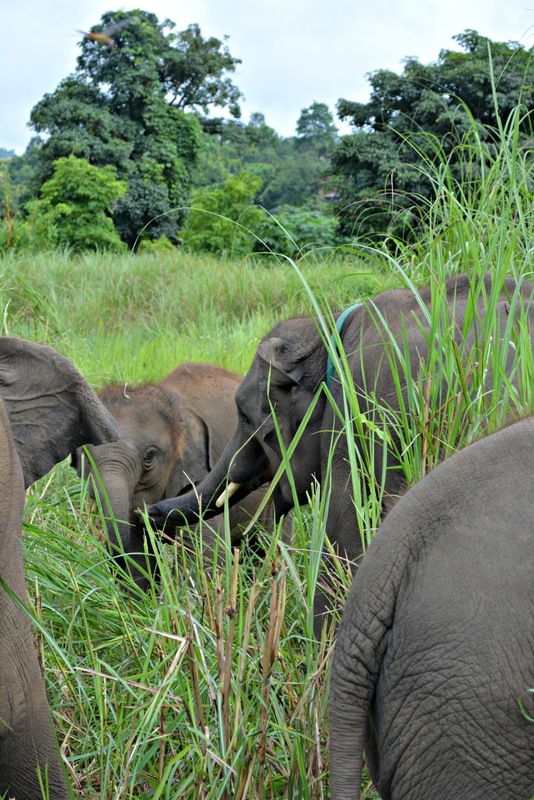 There is one Mahout per elephant, and they are with them almost 24/7. You could see just how much the elephants trusted their Mahout and the incredible bond the two have together. This was where I got to have my first up-close and personal encounter with the elephants. It was apparent just how brilliant these animals are. They quickly were able to find out where the sugar snacks were being kept. Some would sneak up behind you and try to steal a treat. 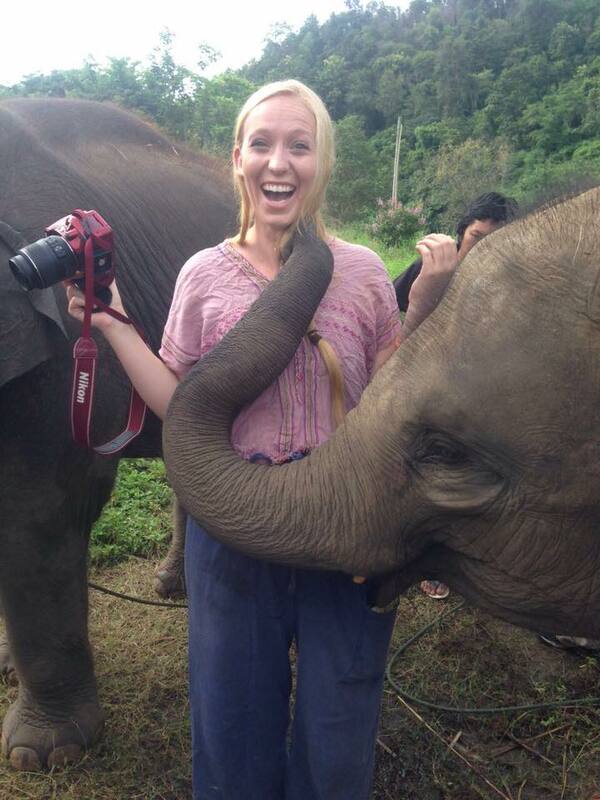 This was when I unexpectedly got a kiss from one of the baby elephants. I’m pretty sure the look on my face sums up exactly how I was feeling. It was one of the most magical experiences of my life. After the elephants had plenty of snacks, we took a nice walk around the sanctuary before leading them in for a mud bath. I have a bit of an apprehension getting into the water where I cannot see what is underneath me. I managed to put my big girl pants on and jump right in. The elephants made themselves right at home. They loved having their mud bath. One decided to lie down while getting bathed. Thankfully I moved out of the way quick enough otherwise I would have gone down under the elephant. 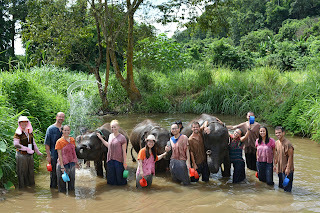 At the conclusion of the mud bath, we walked across the path to the stream where we rinsed the elephants off. The elephants continued to have fun, splashing water back on us. It was the coolest experience I’ve ever encountered. Just to see the elephants acting as they would in the wild. We finished up our trip at the Ran-Tong Sanctuary by enjoying a yummy bowl of Khao Soi. Khao Soi is a delicious dish that is made in Northern Thailand. Seriously, if anyone knows where I can find some in Melbourne, you’ll become my best friend. The perfect way to end an amazing experience. If you have plans to travel to Thailand in the future, I highly recommend looking into volunteering at one of the various animal sanctuaries. Please do your research, though. If it seems incredibly cheap in comparison, there is probably something wrong. Any place, where the animals are doing tricks, will be a place that mistreats the animals. DO NOT spend your money there! Have you ever volunteered at the Ran-Tong Elephant Sanctuary or any other sanctuary in Northern Thailand? Share your experience in the comments below! Love your pictures and themes! This looks like such a great experience! It truly was an incredible experience! I would highly recommend it. They also don't allow you to ride the elephants which was a huge plus in my book.